Born in Inspringen in the Grand Duchy of Baden in 1828, August Valentine Kautz was brought to America by his parents before he reached the age of one. As the eldest son of a successful businessman, Kautz was privileged to obtain some primary schooling and, after volunteering in the Mexican War, attended West Point. Relying heavily on journals which Kautz kept for 43 years, this detailed biography not only discusses Kautz's early experiences but also follows him through his time in the turbulent Pacific Northwest, where he became involved in Indian affairs, including the Rogue River War. 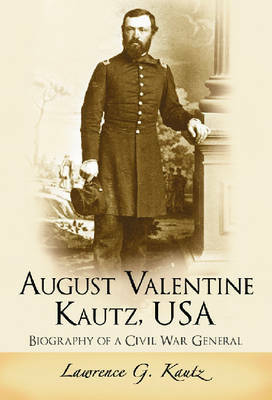 Like so many American military men of the time, however, the defining event in Kautz's career was the Civil War.Originally assigned to the western theater, Kautz's service included participation in the First Battle of Deep Bottom, the Wilson-Kautz Raid (which bears his name), and the Petersburg assault aimed at capturing Richmond. Kautz has often been misrepresented as a less-than-competent commander, and this biography seeks to set the record straight. Period photographs and a number of maps are included.